Some people are pointing to the recent failures of Obamacare as proof that disaster ensues when the Federal Government gets involved in the private industry and tries to counteract Free Market forces. You get no argument from me on that but we didn’t need to wait for the predicted Obamacare failures to arrive at that conclusion. Remember the Chevy Volt? Let’s compare the sales of the Government Motors Chevy Volt to the Nissan Leaf – two very similar Electric Vehicles (EV’s) that were both introduced at same time (December 2010). You can see that while the sales numbers of the Volt beat the Leaf in 2012, the Leaf has now caught up with the Chevy Volt in 2013. 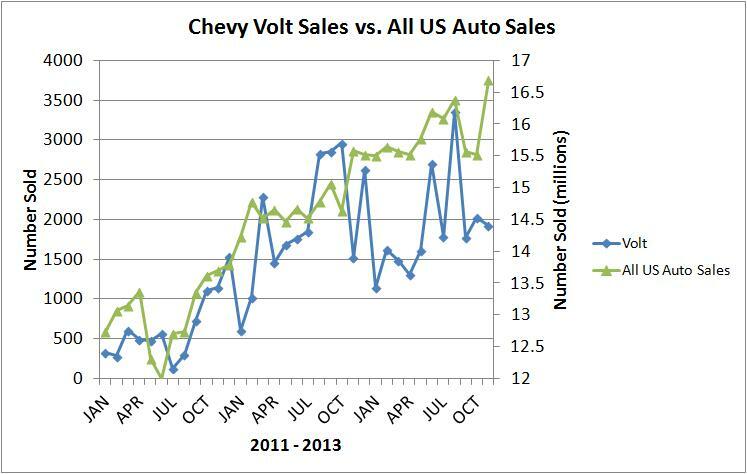 But in reality, the Volt is doing much worse than the graph above shows. When you compare the Volt and Leaf sales to the overall trend of all US auto sales, the Leaf is clearly outperforming the Volt. The Leaf sales are comparable to the overall US automobile sales but the Volt sales are lagging way behind the industry trend. 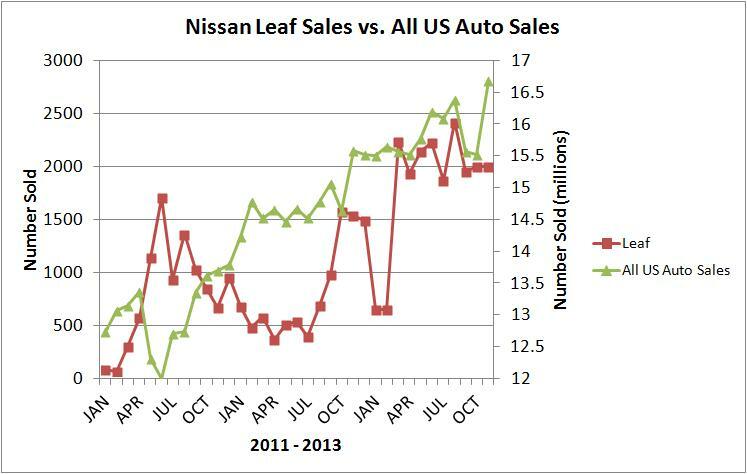 The two graphs below show Leaf and Volt sales on the left y-axis and all US auto sales on the right y-axis. 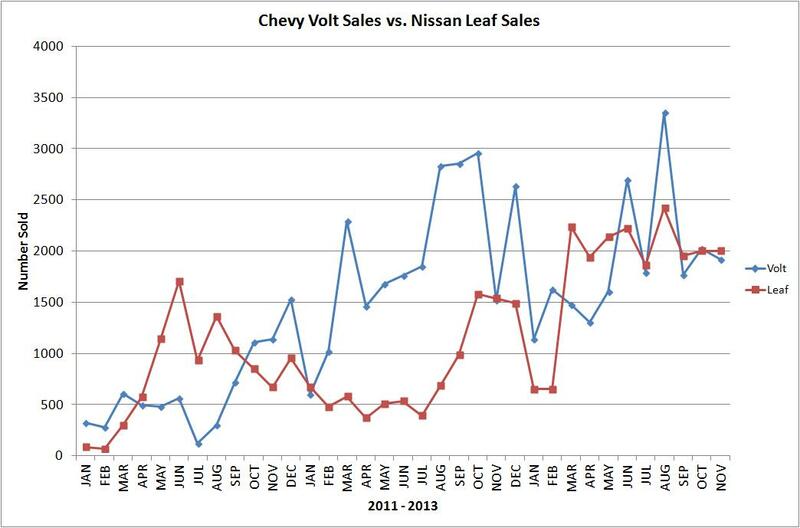 Why did the Leaf outperform the Volt in 2013? Maybe it’s because the Leaf is $5,385 cheaper ($26,685 for the Volt vs. $21,300 for the Leaf). It should be noted that these MSRP’s have been reduced to take into account that both qualify for a ridiculous Federal tax credit of $7,500. Maybe people avoid the Volt because it was a byproduct of huge government subsidies that amounted to $5 billion. After the GM bailout I vowed to never buy another GM product again and I’m sure I’m not alone with that decision so I can see how the Volt sales will suffer from this stigma. Maybe it’s because the Volt has shown a tendency to catch fire during a crash. It’s probably a combination of all the above but I think the main reason for the Volt underperformance is the fact that the Federal Government intervened and rescued a company that should’ve gone through bankruptcy and fixed its problems. What happens when the Federal Government tries to counteract Free Market forces? You get a product that is over-priced and doesn’t meet the needs of the consumer. A Reuter’s article captured it best here. “Over Engineered and over-priced” – Sounds a lot like Obamacare doesn’t it? And full disclosure here, I’d love to buy an EV. An EV is ideal for my long daily commute but right now the Volt is just not financially justifiable for me but I’ll wait for the private automobile companies (that didn’t rely on Federal Government subsidies to compensate for their inefficiencies) to innovate and eventually arrive at a final product that the Free Market always provides – an affordable product in plentiful supply that meets the needs of the consumer. I’ll close with the following video from Ben Howe.